Winsor & Newton Artists' Oilbar is superior quality oil colour in stick form, enabling you to paint and draw freely and directly onto your surface. It is a unique medium because it provides the artist with the buttery consistency and richness of oil colour together with the freedom and directness of pastels or charcoal. 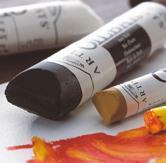 Oilbar is fundamentally different from oil pastels or oil crayons due to its unique formulation. Each of the 35 colours in the range are produced by combining artists' quality pigments with linseed oil, into which are blended specially selected waxes. To provide further flexibility, Oilbar sticks are available in three different sizes. For more information click here. You can view all of the colours in this range by going to our colour chart.